Description: Unleash your imagination and be a God! Create more than 300 concepts and advanced items. 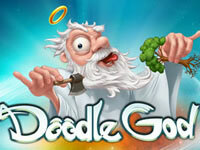 Instructions: Create the Earth in Doodle God Blitz! Use mouse to play.